A very stylish friend of mine is about to become a mom. 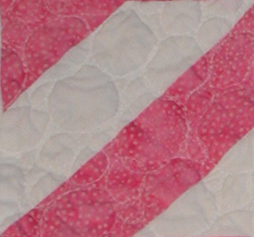 A cutesy baby quilt would not suffice! I made her this small quilt in a trendy houndstooth plaid motif. I machine-quilted it in fun bubble patterns using my free-motion foot. I used “Susie’s Magic Binding” technique to add the pop of turquoise piping. This technique is super easy and looks great.